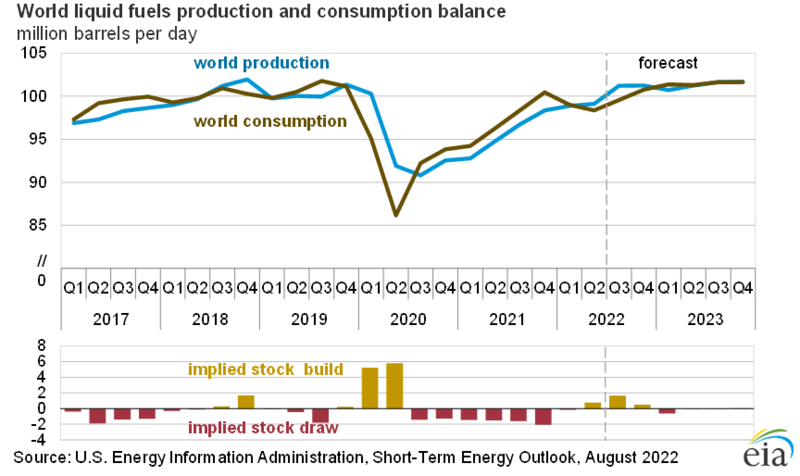 Oil Production at 100 million bbl/d: “Twin peaks straining the system to the limit”? Or just another day at the office in a highly resilient industry? | Watts Up With That? As the oil market reaches the landmark 100 mb/d level, prices are rising steadily. Brent crude oil is now established above $80/bbl, with infrastructure constraints causing North American prices to lag somewhat. Nonetheless, our position is that expensive energy is back, with oil, gas and coal trading at multi-year highs, and it poses a threat to economic growth. 100 million barrels of oil per day… That’s fracking awesome! It is an extraordinary achievement for the global oil industry to meet the needs of a 100 mb/d market, but today, in 4Q18, we have reached new twin peaks for demand and supply by straining parts of the system to the limit. It is “an extraordinary achievement”… But, have we really “reached new twin peaks for demand and supply by straining parts of the system to the limit”? While it is true that booming energy demand will continue to put upward pressure on product prices and rising prices will eventually slow economic growth and curb demand… That’s just the psychological nature of oil prices and not indicative of the resilience of “the system.” The Boom/Bust cycle is simply the nature of the beast. How resilient is the “Oil and Gas System? Pretty fracking resilient, at least here in the U.S.A. I doubt there’s anything in our energy-environment discussion more under appreciated than the sheer complexity of extracting oil and natural gas from the ground and then delivering it to end-users, as safely as possible. It’s a massive 24/7/365 non-stop system, processing 39 million gallons of oil and 3.8 Bcf/d of natural gas every hour. This is a far more challenging endeavor than the anti-oil and -gas business apparently comprehends. But the ongoing effectiveness of it is mandatory: oil and gas supply 65% of the energy that we Americans consume to run the economy. It’s no wonder then that Petroleum Engineering is the highest paying major in college. This elaborate system used for oil and gas extraction and delivery is perhaps most threatened during times of severe weather, such as the destructive hurricanes we’ve had over the past 14 months. To say the least, such events strain the entire network. Just think about the challenge from a geographical standpoint, last month’s Hurricane Florence was double the size of Pennsylvania. Generally, demand ramps up right before the hurricane hits the affected areas, as Americans fill-up for evacuation. This can cause prices to temporary spike because the rest of the supply chain hasn’t had time to respond. Yet things normalize quickly: “Gas Prices Remain Stable Amid the Aftermath of Hurricane Florence.” During last year’s historic hurricane season, U.S. oil prices remained remarkably stable, mostly in the $47 to $52 range. The impact of Hurricanes Harvey and Irma on natural gas prices was mostly muted. Centered in Louisiana and Texas gulf regions, the Strategic Petroleum Reserve is a cornerstone of our response strategy for refiners and can hold nearly 730 million barrels of petroleum – a full 35 days of total U.S. usage (including imports). 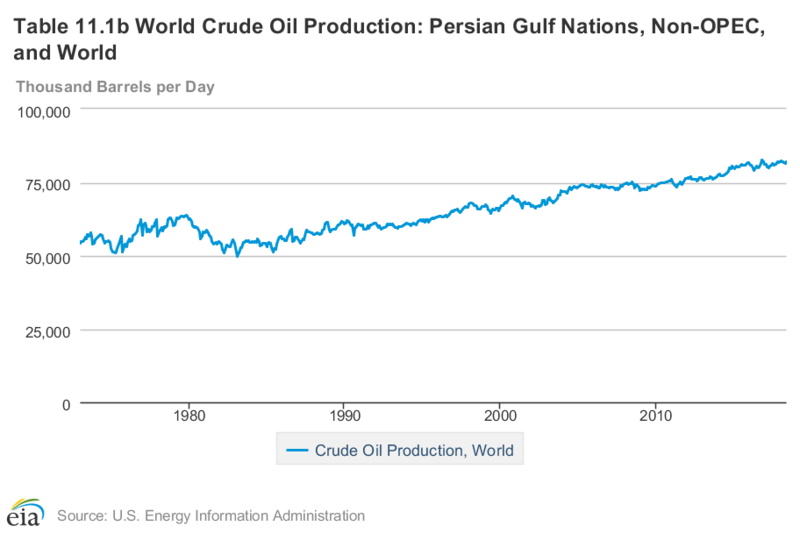 The Gulf accounts for nearly 20% of total U.S. crude oil production. Oil and gas production in the Gulf of Mexico has started recovering after hurricane Michael, the Bureau of Safety and Environmental Enforcement said. With evacuated personnel now back to all 687 manned platforms in the Gulf, the production decline that followed the hurricane’s passage through the area is beginning to be reversed. Still, the BSEE said, 15.8 percent of oil production capacity remains shut in for the time being. That’s equal to 268,824 bpd. In natural gas, 8.9 percent of capacity remains shut in, equal to 227 million cu ft per day. 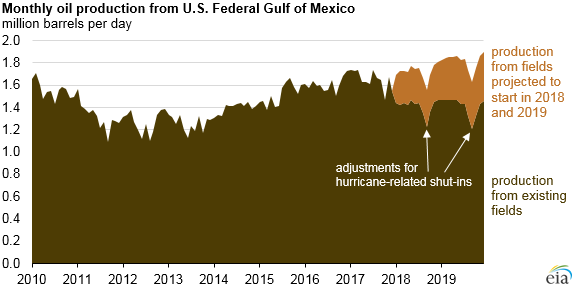 The hurricane shut in more than 40 percent of oil production capacity in the Gulf of Mexico, according to data from the BSEE from last week, as well as almost 32 percent of gas production capacity. A total of 89 platforms were evacuated by the time Michael made landfall last Wednesday in Florida, as well as seven drilling rigs, with shut-in production totaling almost 718,900 bpd. Some 813 million cubic feet of natural gas production has also been taken offline this week. Despite the high portion of shut-in capacity in the Gulf, the developments did not have a significant effect on prices: most of U.S. production comes from onshore reserves, so the 40 percent of GOM capacity not producing last week represents just 6 percent of the total national production capacity. Also, it was clear from the start the shut-in would be temporary, so there was no time for traders to start worrying about a possible supply shortage in the wake of the hurricane, which has become the third-strongest storm in U.S. history. Because of the amount of time needed to discover and develop large offshore projects, oil production in the GOM is less sensitive to short-term oil price movements than onshore production in the Lower 48 states. While shale gets the headlines, the economics of deepwater Gulf of Mexico wells may actually be better. 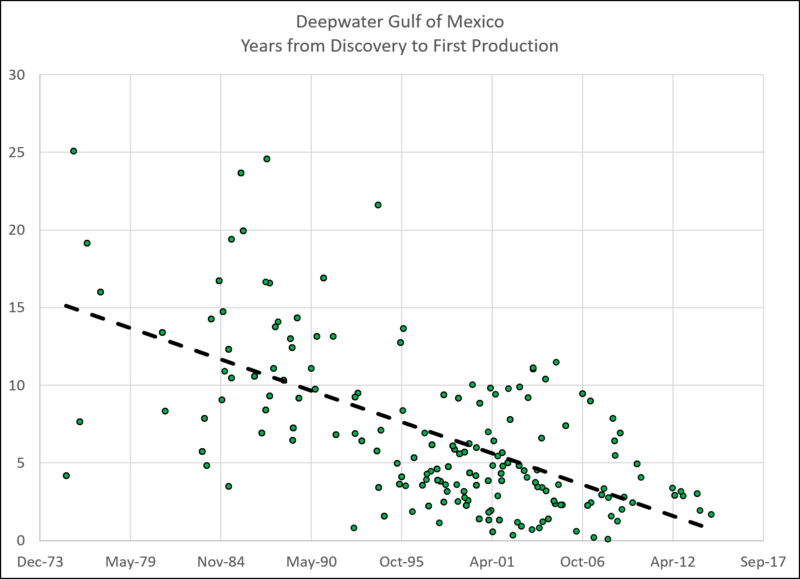 Well productivity improvements in GoM deep water have been more significant than the recent improvements in shale. 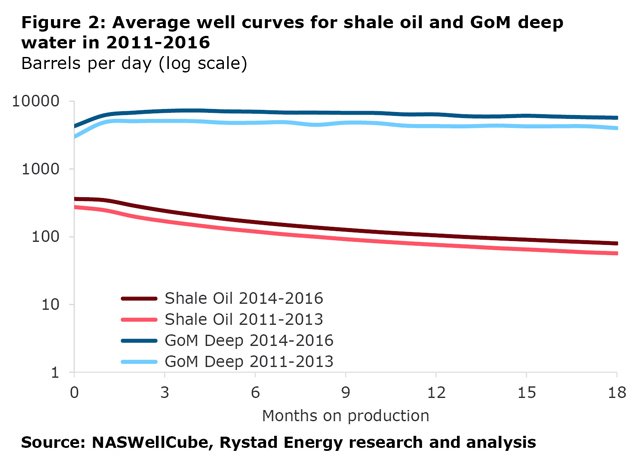 Figure 2 shows average oil well decline curves across all shale oil and GoM deepwater wells in two different periods: 2011-2013 and 2014-2016. Average shale oil well productivity increased by 38% in the first 1.5 years after a well is turned-in-line from 2011-2013 to 2014-2016. The improvements were predominantly driven by the growing contribution from horizontal wells and boosted well configuration: longer laterals, more frac stages per lateral, increased proppant and fluid intensity. However, the average productivity in the first 1.5 years improved even more, by 41-42%, in GoM deep water over the same period. Significant uplift in average well productivity was caused by the high contribution to the average from several deep-water installations in 2014-2016 (e.g. Jack/St. Malo, Lucius) where a typical well produced at the rate of over 10,000-12,000 bpd for more than 12 months. An average recent GoM deep-water well produced 3.6 MMbbl of oil over the first 18 months. 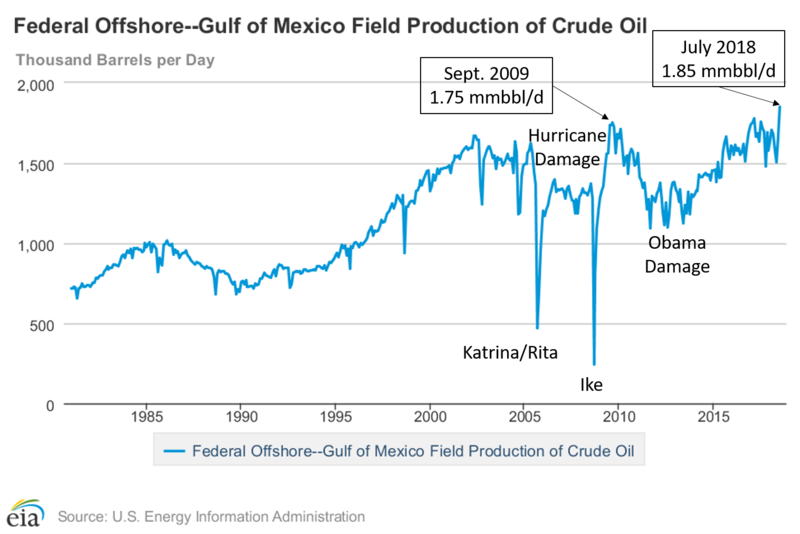 Hurricanes in 2005 (Katrina & Rita) and 2008 (Ike) inflicted extensive damage on Gulf of Mexico oil & gas infrastructure, depressing production by about 250,000 bbl/d from 2006-2008. The Obama maladministration’s unlawful drilling moratorium and “permitorium” in response to the Deepwater Horizon blowout and oil spill depressed production by about 500,000 bbl/d from 2011-2013. After two days of Harvey’s tropical torment, the streets of Tim Duncan’s suburban enclave in Kingwood, Texas, north of Houston, were impassable. The power was out and night falling when word came that another 6 feet of Hurricane Harvey floodwaters were on the way. Wading through waist-high water, Duncan hoisted his wife, Christy, his 6-year-old son and two dogs into a FEMA rescue boat. Duncan, the 45-year-old chief executive of Talos Energy, was beside himself. For four months he had been orchestrating the $2.5 billion merger of his privately held company with Stone Energy, publicly traded and bankrupt. Acquiring a troubled outfit almost as big as his own was a risky play, but it would make Talos a public entity without the expense of a public offering. Indeed, this is a guy who has displayed a knack for making the most of tough situations. Talos’ biggest asset is the Phoenix field (formerly known as the Typhoon field), 165 miles south of New Orleans. It was first developed by Chevron, which drilled a half-dozen wells and installed a production platform, tethered to the seafloor 4,000 feet down. Then came Hurricane Rita in 2005, which capsized the roughly 13,000-ton Typhoon platform and sent it drifting 60 miles across the gulf. Who’d want to clean up after that? Talos would. It now pumps 16,000 barrels a day from Phoenix into a unique ship called Helix Producer, another asset that stirs up unpleasant memories for environmentalists. In 2010 Helix helped capture some of the 4 million barrels that gushed from BP’s Macondo well after the Deepwater Horizon disaster. Output at Phoenix will grow. Talos reexamined seismic data, enabling it to make new discoveries 3,000 feet deeper than the old reservoirs. Hurricane Rita destroyed Chevron’s Typhoon (maybe not such a good choice of names) tension leg platform (TLP), creating the opportunity to deploy the Helix Producer I to resurrect an oil field, now called Phoenix. The Helix Producer I (HP1) was converted from a North Sea train ferry into a floating production unit (FPU). It was the first ship-shaped FPU in the Gulf of Mexico. How’s that for resilience? A production platform that can dodge hurricanes and respond to oil spills! And Bill McKibben thinks that a group of kayakers could slow us down. David Middleton has been a geophysicist/geologist in the oil & gas industry since 1981, including 6 years with Helix’s E&P subsidiary, ERT Gulf of Mexico (2006-2012). But but but resource prediction models supposedly factored in technology…..and still got it wrong. Perhaps not all technological shifts are created equal. Just need better quality alarmists. Thank goodness for renewable’s massive 4% contribution to our energy needs or we’d really be in trouble. What we know, don’t know, cannot know, and cannot manage. Chaos (e.g. evolution) ensures that science will remain a near-frame philosophy and method. Good point! Battery tech has not grown near as quickly as drilling tech. And no one predicted it like they predict battery tech growth – or drops in cost of solar and wind due to tech. It is risky to assume Venezuela will stay down forever or that Canada will permanently block pipeline projects. 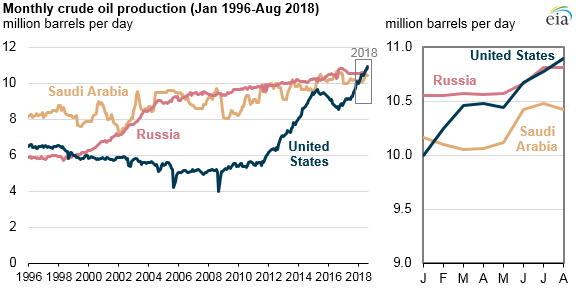 It might do better to question Russian conventional oil output going forward. Separability, it appears that major auto makers have gulped the kool aid on power train predictions and EVs. The next financial crisis will come from them. Venezuela is on schedule to produce less than 1 million BOPD in 2019. The Maduro regime should fall in 2019, but the damage inflicted on reservoirs, wells, and facilities, is so serious that we will not return to 2 mmbopd for at least five years. The Gulf of Mexico is a mature province, and discoveries are getting pretty scarce, so its unlikely production can grow very much unless oil prices stay above $80 per barrel. The shales are a bit more competitive, but the Bakken is starting to run out of quality drilling locations, so it will also need $80 to $100 per barrel to keep production steady after 2019. One issue many fail to understand is that refineries run on crude oil and condensate, and the energy agencies report all sorts of liquids as “oil” which don’t really make much difference. Refinery runs are about 82-83 mmbopd, and right now we are drawing crude from storage (one reason why prices are high, the other being market instability). Refinery throughput isn’t growing as much as total “oil”, one reason being that the light crudes from shales include a lot of ngl. 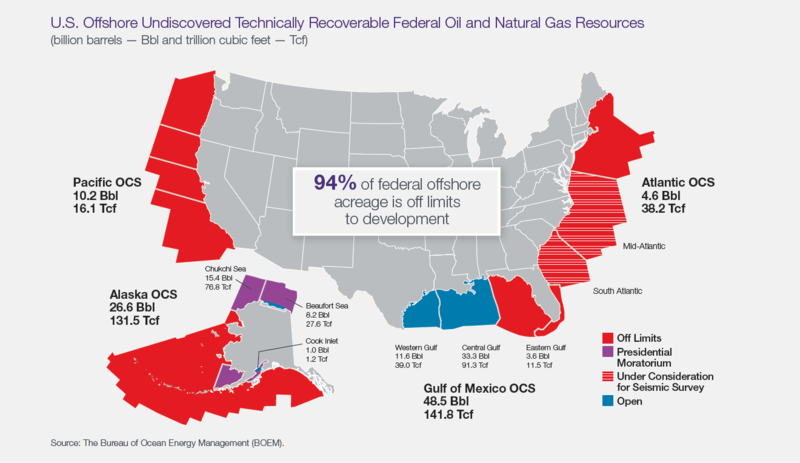 On the US side, much of the Gulf of Mexico remains off limits for political reasons, not economic or geological. Ditto the east coast of the US. The Gulf of Mexico area that’s off limits is mostly offshore Florida, where the prospects are very mediocre. There isn’t much of an effort by oil companies to have that lifted because they know it’s not worth the effort. The same applies to the East Coast, it just doesn’t have that much potential. Oil just doesn’t show up everywhere. As far as I can tell from rig activity and the way the money is heading, the last area with significant potential is the Permian Basin. Bottom line is that to keep getting oil out we will be asking for higher prices. 20 years ago with swooned when we thought oil could go to $20. Nowadays most of the new oil fields we find need at least twice the 1999 price to be put on production. Offshore Florida has very significant crude oil potential. The first offshore discovery in the Jurassic Norphlet sandstone was made by Mobil Oil Company in 1979. As of 2010, Norphlet fields in the Mobile Bay area had produced 4.5 trillion cubic feet (TCF) of natural gas. Chevron and Murphy Oil made a Norphlet discovery in Federal waters of Destin Dome area offshore Florida in 1985; however the State of Florida prevented them from developing it. A total of three wells were drilled. The subsequent moratorium has prevented the development of this field for 32 years. The leases (Destin Dome blocks 56 and 57) are still held through a “suspension of operations” (SOO) agreement until 2022. Shell’s deepwater Norphlet discoveries are oil and run right up to the CGOM/EGOM boundary. Shell Offshore Inc. reported its sixth oil discovery in the Norphlet geologic play in the deepwater US Gulf of Mexico. Drilled to a total vertical depth of 29,000 ft, the Dover well encountered 800 net ft of pay in the Jurrassic Norphlet. The well is in 7,500 ft of water about 170 miles offshore southeast of New Orleans on Mississippi Canyon Block 612. Shell is the sole interest holder. The discovery lies 13 miles from the Appomattox host platform and is considered an attractive potential tieback, the company said. The Appomattox host platform is on location in the gulf and is expected to start production before yearend 2019. The Appomattox facility is expected to peak at 175,000 boe/d and has a breakeven price of less than $50/bbl. And the Norphlet is only one of about a dozen plays in the EGOM. Oil companies know that the chances of getting these politically bans lifted are close enough to zero that the difference can’t be measured. We don’t know how much oil is or isn’t there because even exploration is banned. Of course the expense of exploration without a chance of actually drilling is a fools option. The oil companies don’t try to lift the bans because they know they will lose and become very unpopular in the process, besides there are plenty of good sites elsewhere, they don’t need to drill off of Florida for now. The Norphlet sector outside the banned area has barely been touched. Shell’s discoveries are marginal, and we know that a move into even deeper water and farther away from land drives up costs. In the oil industry we prepare predrill exploration prospect estimates and risk analysis (Im an engineer but i worked partime with a team developing some of the software used to estimate prospect resource distribution and economics in the late 80’s and early 90’s). And although I haven’t worked the Gulf of Mexico for decades i get called in to consult on the viability of Eocene deep water developments. Everything I see tells me the prospects are running out, getting more marginal, well rates are much lower, recovery factors aren’t that good, wells really struggle when they start to produce water, and its increbibly expensive to do well trouble shooting and repair. I don’t know much about California, but i assume it does have fairly decent heavy oil prospects. We do have to remember that California offshore has a limited areal extent because its in an very tectonically active area. In any case, other areas around the world ARE open and don’t pan out at all. For example, the area around the Falkland islands was always touted to have large reserves. 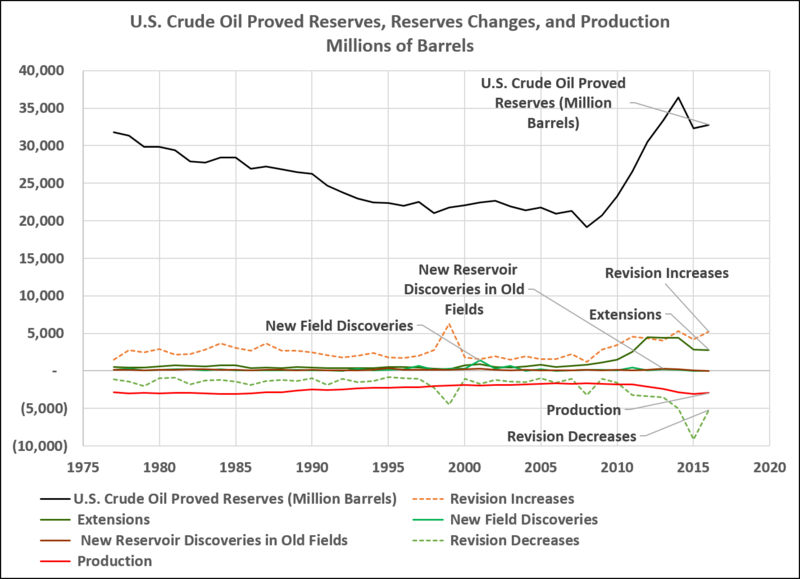 Thus far it has a few marginal discoveries and very little is being done to produce those hypothetical giant reserves which have never panned out. The oil-prone Norphlet in shallower water than Appomattox is almost entirely in the off limits area. Appomattox WD ~7,400′. Shallower water is to the north and east of Appomattox. Shell’s Appomattox complex is in the neighborhood of 650 million BOE. The facility is designed for 175,000 bbl/d and capable of ~240,000 bbl/d with some de-bottlenecking. Their FID was $50/bbl, breakeven is around $27/bbl and pre-tax IRR at current price deck is around 26% (Wood Mackenzie). Shell doesn’t sanction marginal $9 billion CapEx projects in the deepwater GOM. The area around Appomattox was the most heavily bid area in the March 2018 lease sale. I forgot to mention the political bans that prevent development in and offshore of California. David, as you know exploration economics are run on predrill estimates. 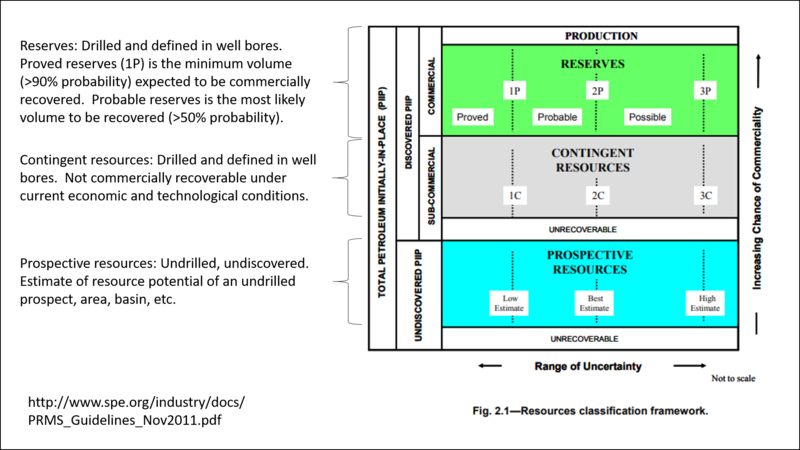 Lets say a prospect has a post discovery PV10=0 at $50 per barrel. Depending on whether it can be produced sooner or later, and the flow rate which can be run through existing facilities, pre-drill economics may require $70 per barrel. If the acreage was obtained by high bonus, it may lead to the acreage being dropped because its better to take the tax writeoff. I have seen discovered fields dropped for that reason. We both know the Florida shelf was a highland in the Jurassic, and this limits the extent of the potential exploration area. There’s also reservoir risk, and distance from shore and water depth come into play. Thus the exploration economics are set by a company’s degree of knowledge and optimism, including optimism about prices. And this is the key. These deep water plays require higher prices than we have seen in recent years. Right now we are seeing prices go up, in part because of Iran sanctions, but also because we ARE UNABLE to replace what we produce via exploration. And the only way we can get more aggressive is to have higher price expectations. Things change a lot at $100 (thats the price we need to have to recover Venezuela heavy oil when we also have to build an upgrader). And at $120 everything starts looking great. But there is a point where the oil price starts impacting demand. So we have a window to play with. But the crude and condensate we produce, what goes into the refinery and makes gasoline, kerosene, and diesel is not climbing as fast as the total liquids. And this means the IPCC projections are no good. The work done by Nordhaus lacks quality, emissions wont be as high as he has said, and this means the economics used to justify things like Obama’s Clean Power Plan are garbage. “Discovered fields” aren’t dropped for the purposes of tax write-offs. They’re dropped because the exploration/exploitation drilling didn’t support sanctioning the development. Now, this can create and has created opportunities for lower-overhead, more efficient operators. LLOG developed Macondo after BP walked away. Deepwater projects that majors dump are money-makers for smaller independents. In the case of Appomattox, Shell has drilled about four different economic discoveries in the Norphlet. These discoveries will be completed as subsea tiebacks to the Appomattox platform. The platform and much of the subsea infrastructure has already been installed. The FID point was about three years ago. Appomattox has a positive NPV above $50/bbl, a simple breakeven price of ~$27/bbl and an IRR of 26% using the current price deck. If their cost of capital is 7%, a 26% IRR is pretty damn good. Once they’re up and running, it creates opportunities for other companies to exploit smaller prospects in the area… Particularly after Appomattox’s production starts to decline, Shell will be “happy” to collect PHA’s from competitors wanting to flow back to their facility. Most of the Mesozoic resource potential of the Gulf of Mexico is in the EGOM and off limits… And the Norphlet is the largest component of that resource potential (1.7-3.2 Bbbl & 8.5-19.3 TCF). The maturity of the play and proliferation of brownfield projects has shrunk the average development time down to less than 2 years. For now the Lower Tertiary play sits in the shadow of its longer established higher producing neighbors, with the production and recovery efficiency of its fields yet to be fully proven. Various yet-to-find estimates indicate the industry could double the current discovered Lower Tertiary resource base with continued drilling. There has been a significant ramp-up in exploration over the past decade, with the play’s technical success rate running at more than 50% for the 60 or so wells drilled to date. However, drilling activity in recent times has slowed down and is likely to remain that way in the near-term future due to the current price environment, although industry costs also will continue to fall. At present the industry has only a limited sample of production data from producing Paleogene projects such as Chevron’s Jack/St Malo and Petrobras’ Chinook/Cascade, and it is likely too early to draw definitive conclusions on long-term potential and recovery from the play. Technology and the understanding of the full production operating envelope as production data becomes available will ultimately drive peak production rates and ultimate recoveries. In the Walker Ridge area the company’s Lower Tertiary ultradeepwater Stones development—the deepest production system in the world—is due onstream imminently and will flow its hydrocarbons via subsea wells to its FPSO unit. Stones production will add more data to the industry question of how to optimally develop the Lower Tertiary play in the Gulf of Mexico (GoM). Shell also has the Appomattox development in the eastern GoM that received sanction as well as three material discoveries that it is currently working on. The Lower Tertiary is a play that emerged in an era of rising oil prices, higher costs and maximum volume/value focus—very much an enabling environment for opening up a new play. But it is increasingly likely that it will be fully developed and matured in a very different era, one of minimum scope/maximum scale and a requirement for disciplined capital deployment and returns. The GoM has, of course, been at this brink a few times before—the Shelf to deepwater, amplitude plays to poorly imaged subsalt, shallow to very deep reservoirs, and normal pressures to HP/HT, for example. It is almost inevitable, therefore, that perseverance, innovation and competition will converge to allow the industry to successfully unlock the next chapter in the GoM’s deepwater life cycle. Thanks Fernando. I was going to ask if the figures were C5+ and had been vetted of Natural Gas Liquid numbers. (For the uninitiated, NGLs are gases at room temperature and pressure, but are shipped and stored as liquids. They aren’t useless, but neither are they plug in replacements for petroleum). Apparently the 100mb/d does include ngls? I would point out that the world tolerated $100/barrel petroleum a decade ago, and I can’t see any reason that it won’t tolerate it again. As long as every cocaine cultivator in Bolivia and every yak herder in Central Asia wants two SUVs parked in the dooryard, there is probably going to be a healthy market for oil — even moderately expensive oil. Basically, everything that goes into refinery feedstock. David, My understanding is that NGLs aren’t really “refinery feedstock” in the sense of stuff you make gasoline and diesel from. They are used as a feedstock for plastics. Or they are purified, perhaps remixed, and sold as (premium) fuel for home heating and industrial applications (“Propane”, “Butane”). Not that they can’t be used for transportation, but they’d need an infrastructure that mostly doesn’t exist. e.g. Our local Propane dealers don’t run their vehicles on the fuel they sell even though they have huge tanks of the stuff in their yard. It’d be technically feasible to do so, I think, but I imagine engine/fuel tank modifications would be needed. … not to mention EPA and possibly NHTSA approval. NGL are found as part of the crude mix being fed to refineries. But that crude is run through distillation units to remove the light ends (NGL and tiny amounts of methane are undesirable further down the train) as well as very heavy molecules which eventually become a very heavy crude/asphalt we usually feed into cokers. The NGL are considered petrochemical feedstocks. Some refineries are designated as “refinery complexes” because they include a standard refinery kit plus other gadgets. OPEC limits itself to controlling crude oil production and leaves condensates as an unregulated stream. Condensates are a very heterogenous family. They are liquids condensed out of “wet gas” streams, molecules which are found in a gas phase at reservoir conditions but condense as the fluids are cooled and the pressure is dropped. This topic is so complex many petroleum engineers need special training to get a handle on how this works AFTER they finish school, so I wouldn’t worry that much about the details. Bottom line, refinery runs are a key parameter, and they usually match the crude oil and condensate statistics. And this figure is running at roughly 82 +/- 2 million barrels per day. 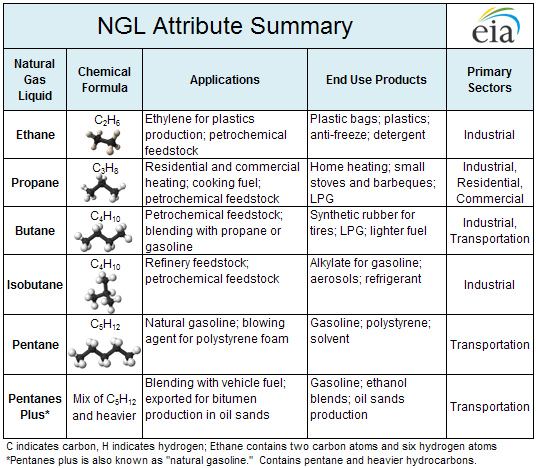 Most NGL go into petrochemical feedstock, however butane, isobutane, pentane and heavier NGL’s are used in motor fuels. The heavier NGL’s are also used as as diluents for bitumen (DilBit)… About 60% of the bitumen from Canada’s oil sands are transported as DilBit. That said, there is a strong demand for NGL and that demand is expected to grow. NGL comrprise about 20% of the global demand for petroleum liquids. If you want to limit it to just crude oil and lease condensate, production and demand are still growing. Don, the price increase is inexorable/unstoppable. I’ve seen estimates which indicate the point at which the world economy starts to hurt is around $125 per barrel. Notwithstanding the comment made elsewhere, we dont feed NGL into refineries to make diesel and gasoline. The NGL are mostly being used for plastics, or go into LPG and butane bottles. So if we focus on crude oil and condensate (the real deal), total production matches quite nicely the refinery runs, about 82 million BOPD. And this figure is barely increasing, but it does keep going up. Meanwhile we see lousy exploration results on a global scale. It’s important not to be decieved by figures reported as barrels of oil equivalents (BOE). Those figures include natural gas converted to an “oil equivalent” which happens to be somewhat irrelevant but it’s popular with company management because it helps inflate figures. I consult occasionally for companies kicking tires, looking for properties to buy, and we never ever lump oil, NGL and gas into a single stream, simply because they fetch different prices. So for example, lets consider an exploration prospect in deep water offshore West Florida. The target rocks are Jurassic age, they are expected to be overpressured and have a high natural gas content (depending on the model, some would say they will be natural gas/condensate). So the prospects involve very deep water, drilling through the Tertiary into hot, high pressure Jurassic. Each well costs about $150 million in today’s environment (rig rates are way down because there’s less demand). And if we get a discovery we have to develop it with a deep water vessel which costs a fortune. So this means prices have to be high, and the investor needs to make sure they will stay high for at least 15 years. This works the same for exploration or developing known marginal accumulations. They require steady and ever increasing prices. This in turn leads to a collision between industry need to get a higher price and the ability of poor countries (and the poorer sectors in rich societies) to buy refinery products. Which takes us to the hypothetical $X per barrel barrier. I’m not into peak oil theory, I simply look at it as a business issue (where do we go to get more oil and make decent money?). And its just getting really hard to find a decent spot. We need higher prices. And I don’t see a way out. The Gulf of Mexico is a mature province, and discoveries are getting pretty scarce, so its unlikely production can grow very much unless oil prices stay above $80 per barrel. “Mature” means that there is infrastructure and well-established production. In the GOM, the shelf is very mature, deepwater is just coming into maturity. In 1985, deepwaater fields accounted for only 6% of GOM production, in 2016 it accounted for 87%. With increasing maturity, the average lag from discovery to first production has shrunk from 15 to less than 2 yrs. 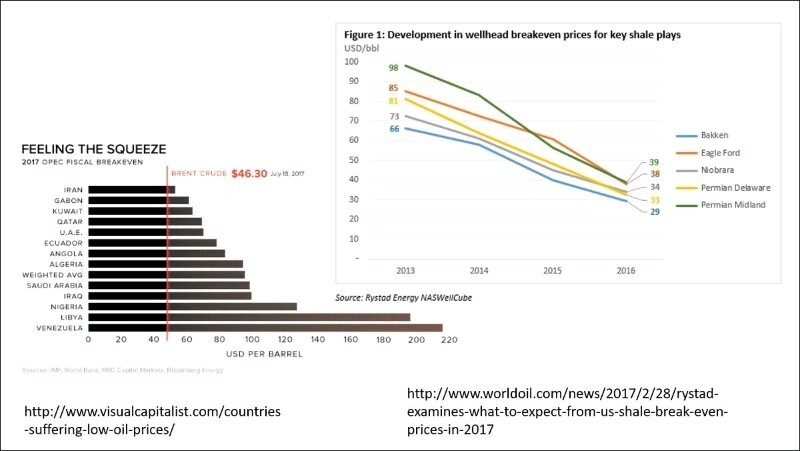 Break-even costs for deepwater greenfield projects have dropped from $50-60/bbl in 2015 to $30-50/bbl in 2017 and have the potential to fall to $30-40/bbl in the near future. Brownfield projects tied in to existing infrastructure have even lower break-even costs. Must be nice to be extremely optimistic. But reality bites. Mature means we pounded the hell out of it, and new discoveries aren’t close to what they used to be. Hook up times are short because many new discoveries are small, get hooked up to existing facilities. We are more efficient because we laid off a bunch of people and the survivors are smarter and tougher, and because contractors went through the same darwinian process. In the end, the debate is meaningless. The Gulf of Mexico, like the North Sea, Indonesia, the Caspian offshore Azerbaijan, Angola, and many others, has already seen its best days. Production increases because prices are high. And nobody in their right mind would forecast the oil industry can survive at less than $80 per barrel. Must be nice to be totally ignorant of the Gulf of Mexico and spout nonsense. I’ve worked the Gulf of Mexico every working day since April 1988. 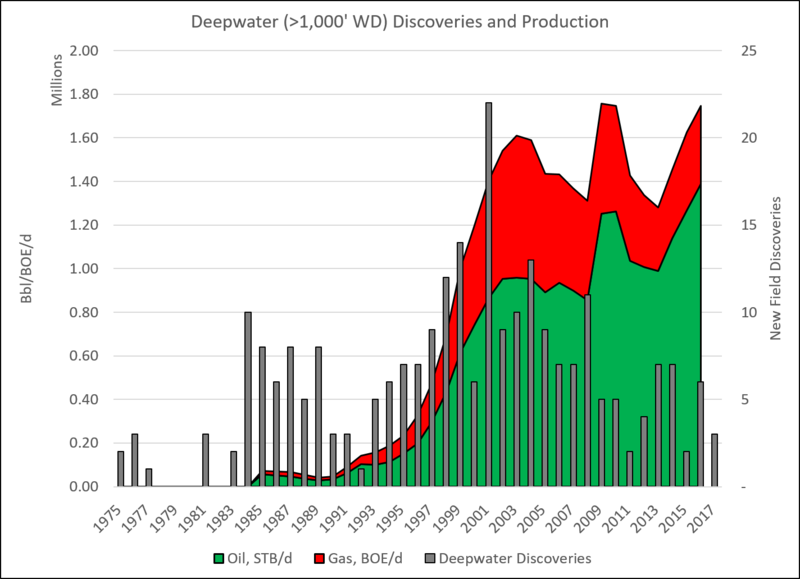 While the shelf is in terminal decline, deepwater is just coming into its prime. And the shelf is far from dead. Players are moving back into the Gulf. Shell’s deepwater Norphlet discoveries are oil. Most of the well logs are publicly available. The Appomattox platform has been installed, subsea tiebacks are in progress and first production is a few months away. It’s a challenging development, but it’s massive and the play runs right up to the CGOM/EGOM boundary. C4’s and higher are used in motor fuel refining. The Gulf of Mexico, US only, is still growing. And the Mexico side of the Gulf is only about as mature as the US was in the early 1970’s. However, outside competition has forced Pemex to improve their game. I agree that the Gulf of Mexico is mature and will not yield as much as it has in the past. It needs very expensive oil and gas to make the development economic. I disagree with the shales being competitive because the sector has NOT GENERATED sustainable positive free cash flow in any of the past ten years. That was when the prolific core areas were still available to exploit. But those areas are now mostly gone and there is no way to have economic production by drilling the marginal targets. The Bakken is now dying as the per-active-well-production is down by around 40% from the peak. Production has been added by drilling marginal targets and taking a loss on that production. That is a good strategy if you are an energy sector employee looking to get paid for a few more years. The Gulf of Mexico *is* yielding more than it did in the past. Which is the greener of the two.. a wellhead blowout in the Arctic or a double hulled tanker with a world class support system navigating the Straight of Georgia? Just as interesting is who is buying all of this extra. I thought about including the David Lynch angle… But I was never much of a David Lynch fan. Just kidding. I know he’s not everyone’s cup of tea, but I’m a big fan. A friend of mine got me to watch Eraserhead back in the ’80’s… Freaked me out… Although Blue Velvet was kind of interesting… in a creepy way. Fracking good report, David. And all of this oil production is Green Energy (come on environmentalists, the CO2 is re-cycled into the atmosphere and into plants and the Earth is greening! Deal with it!). Making money, powering a modern society, and greening the Earth! Maybe you should rest on the 7th day? You mean that paper bags aren’t replacing plastic, and computer cases and keyboards aren’t going to made out of wood? But at least CA has banned plastic straws, in order to save the Earth! Well, oil’s well that ends well. Ahh, how excess liquidity can get smart people to ignore the elephant in the room. American oil and gas production growth is coming from uneconomic production driven by easy access to credit allowing the shale sector to be cash flow negative year after year. The only significant producer that may have the capacity to bring online at lower prices is Russia. If we had plenty of oil, why do you think that companies are going after deep water deposits? Because the economics of deepwater are better than shale… if you know what you’re doing. In comparison, almost all the leading shale plays in the United States are witnessing significantly higher breakeven oil prices. Per Bloomberg New Energy Finance , the breakeven prices for Eagle Ford East, Eagle Ford West, Three Forks (Bakken), STACK (Anadarko), SCOOP (Anadarko) and Niobrara (DJ Basin) are $48, $61, $56, $58, $66 and $63, respectively. Just read this article in my evening scan after reading the BBC shedding tears for Lancashire now that Quadrilla have finally begun fracking. Harrabin is having an apoplexic fit and the useful idiots are cementing themslves into tyres (Don’t Ask!) and crying tears over the awful fate of Lancashire with a new industry and lots of productive well paid jobs on the horizon. Harrabin has us ceasing to use hydrocarbons by mid century yet he does not indicate what they might be replaced with. 80% of homes in the UK ( about 17 million) are heated by gas. They also cook with gas and own petrol or diesel cars. Their windows, doors, clothes, chairs, beds , carpets, decor, are all derived from hydrocarbons…and I cannot see the ground unicorn horn industry keeping up with demand, or enough angel dust fuel being produced to power the fairy chariots to get people to their work clearing up bird corpses around the wind turbines. <Tis a funny old world. … and Shell “going Green to survive” according to the Daily Telegraph, i.e. spending a few billion on green PR to placate the mob, lapped-up by the green-obsessed MSM. I still think it’d be prudent to get some 4rth gen nuclear plants up and running. This is what efficient industries look like. Only in government is “spare capacity” carried on the books “just in case”. If demand increases, I have confidence that oil producers will meet the need. Spare capacity enables OPEC to manipulate prices… When they have spare capacity. The private sector doesn’t have much in the way of spare capacity. We produce oil & gas at the highest rates compatible with efficient reservoir drainage. What spare capacity? The Saudis have tried to rehabilitate failed oil fields abandoned in the 1970s due to all of the technical problems that make economic production unlikely. Most OPEC nations are well past production peaks. The US increase has come at a massive cost of malinvestment that will have to be written off when most shale companies go bankrupt because they cannot pay off their maturing debts. The story you are pushing is a scam that will harm the rational sceptics who have bothered to look at the data and argue that it does not support the AGW myth. Pushing a shale miracle myth is not any better than what the IPCC is doing. That’s why I wrote “when they have it.” Saudi Aramco has managed their oil fields very well. That’s why Gwahar is still rocking at ~5 million bbl/d and will recover close to 80% of the oil in place. OPEC can only influence prices when they have spare capacity… Which is currently very little. I’m not “pushing the shale miracle.” I’ve pointed out several times that the economics of deepwater GOM are superior to shale. The shale players who were going to go bankrupt already did so when prices collapsed. At current prices, most shale plays are marginally economic, largely due to cost-cutting measures. As prices decline frac costs will decrease. Production companies with high costs will go bankrupt and their fields will be bought for lower prices by surviving companies. The oil never goes away. I think this is called capitalism. As always, great compilation David. Just imagine how much could be produced if we could replace the socialist regime in the Peoples Democrat Republic of California with a regime that recognized property rights. Such beast doesn’t exist! None of those so called PDRs are for the people, nor are they democratic! They’re just nice sounding names nothing more nothing less! It’s just the typical lefty MO of naming things contrary to what they really are. It fools the gullible, but no one else. David, many thanks for another useful and most interesting post. I remember 10-20 years ago, maybe less, we were at 80-90 million barrels a day global oil production. Now we are at 100 million BPD, and there is absolutely no possible way that a large majority of FF usage will be going down anytime soon. Just the increase in population growth and economic growth over time dictate the general carbon usage per capita has to increase especially if we have an improvement to quality of life for more people and if population increase then carbon usage also goes up. There is no such thing as de-carbonizing an economy. By default, the two are synonymous, life and economies relying on the very positive nature of carbon itself. Unless life somehow transitions to silicon in some VR reality, we will always be a carbon intensive life form and economy. Luckily, CO2 from intensive carbon utilization is not harmful to the planet or life itself. That is borne out by just opening your eyes and looking around. The carbon tax is such a hideous attack on our poor and middle class, that this becomes a major drag on the economy that affect all of us. I guess in all truthfulness then, this is exactly their point, that they want to destroy the economy and populations by default. That makes them no better than the rest of the demons of history with the likes of Pol Pot, Mao & Stalin et al. Instead of direct murder, they just limit access to life, or make it so unaffordable that much of humanity cannot afford to live. There is not much difference in the carbon tax and a future tax on oxygen. The only problem on the much longer term horizon is the scarcity of affordable fossil fuels at an acceptable price point. Then that could be a big problem in 50-100 years for complex long chain carbon molecules for the thousands of products that an advanced society relies on. But then humanity always is able to innovate solutions to most problems that come our way. That should be no different, unless the anti carbonista types are successful in continuing to demonize ‘carbon’. I’m sure the Greenies will applaud $100 oil, and hope to see it go to 2,3, and even $400. Because oil is a “poison”, and is “destroying the planet”. Though they still use and need it, especially to get to big gatherings of like-minded folk, who “hate” oil. They believe in magical energy. Energy that is one with the universe. Ooooohhhhhmmmmmm! “Peak Oil” is a real thing. It’s just not terribly relevant. We’ve had as many failed “peak oil” predictions as we’ve had failed global warming “tipping points”. I would encourage all of you here, including the author of the post, to do a simple calculation: look up oil consumption per capita in the EU and in the North America, and ask a simple question: if we want to bring the world population to this level of usage (EU or NA) what sort of increase in global oil production would be necessary. Do it, post the results, let’s talk then. World population is reliably forecast to stabilise at 11bn. That population would require a 5-fold increase in current oil production to achieve the same per capita consumption as the USA. It would only require a 3-fold increase if the per capita consumption was the same as EU. Diesel price in Australia has again reached AUD1.60/litre. That price gets me thinking about my right foot again. Iron ore demand leads oil demand and Australia has enjoyed a 3-fold increase in iron ore demand in the last 20 years. It gave the economy a great boost during the growing phase and there is still lingering prosperity from supplying the demand at the higher plateau. There may be another boost as India continues to emerge but it is not like the impact of China. Africa should be able to source its own demand so not much there for Australia. A lot of people believe that the 11bn forecast is way too high. I think,something on the order of 300-400 mb/d. However, factors like the futulity of owning a car in a densely populated developing world cities, greater engine efficiency, probable switching of some vehicles — especially fleet vehicles — to electricity or to CNG probably mean that considerably less will be needed. There’s also a LOT of oil in Alberta’s tar sands and Coal To Liquid isn’t outrageously expensive — probably around $100/barrel. IIRC, Sasol currently produces a couple of hundred thousand barrels of oil from coal in South Africa, but the capital costs for their plant are probably long since paid off so they can produce oil from coal cheaper than a new plant could. It would be fracking awesome! Just let us know when peak oil is reached so we don’t totally f-up. We won’t know when we will hit Peak Oil until we’re about 30 years past it. There is a massive untouched reserve of oil near East timor and a couple in the south China sea (which is likely why China is making claim). If there is one thing I really can’t stand, it’s climate guys talking abut Peak oil as if it were just another Greenie scare tactic. This is not even remotely close to being the case. Global Warming is nonsense, but Peak Oil is absolutely real and extremely significant. The two have absolutely nothing in common with one another. Listen to the many excellent podcasts by Art Berman for a good summation of the current state of the oil industry. Julian Simon’s principle that human ingenuity and technology will outpace resource scarcity has been proven to be correct over and over and over again. Peak oil is not a problem. Art Berman writes some interesting articles. And he’s right about shale not being a “revolution.” However, I would recommend M. King Hubbert over Art Berman. It’s called the Hubbert curve, not the Berman curve. 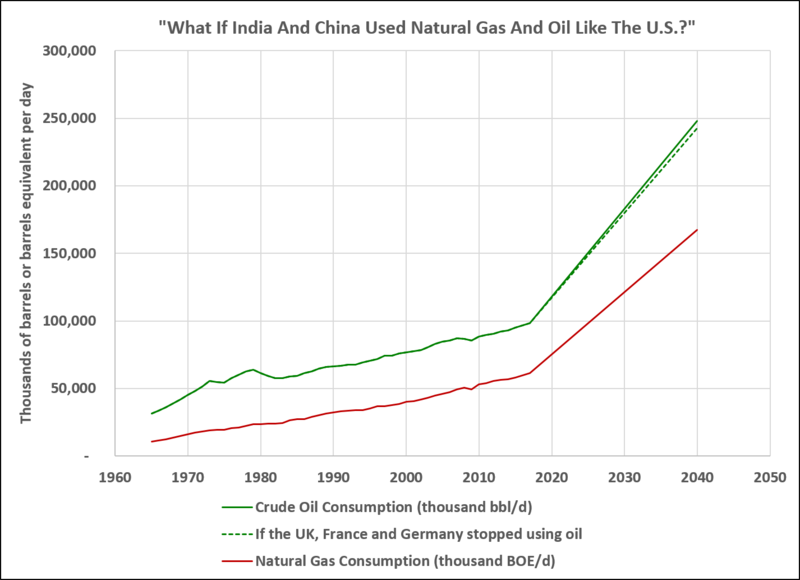 Peak oil is both real and irrelevant. Oil is a finite commodity. In general, global production will follow a logistic function. The ultimate peak production rate will occur sometime around when we’ve recovered half of the recoverable resource. The total recoverable resource is unknown, but very fracking YUGE. Much YUGER than Hubbert thought it was. DM: “Peak oil is both real and irrelevant. Oil is a finite commodity. 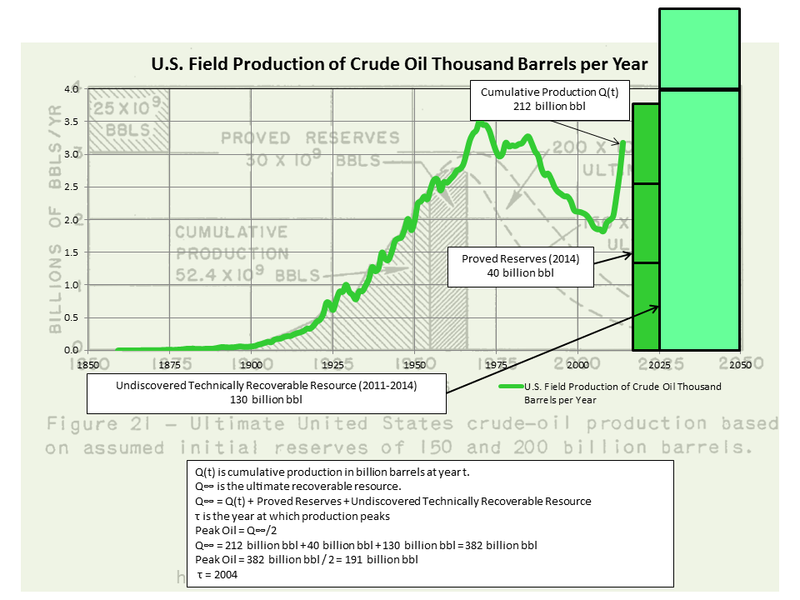 ” I agree with your basic premise that Peak Oil is being pushed further into the future. However, I don’t agree that oil is a finite commodity in any meaningful sense. We already have bioengineered microorganisms that can produce oil. They are not economical yet. However, almost certainly as the amount of scientific knowledge increases in a manner similar to compound interest, the efficiencies in producing oil from microorganisms, or potentially, in developing oil substitutes will produce new economically viable forms of energy. It’s finite in the sense that we consume it at a rate several orders of magnitude faster than the Earth generates it. While bio-engineered algal lipids might allow us to generate oil faster than the Earth, it’s still probably not going to be faster than we consume it. Also… The “finite” actually refers to the ultimate recoverable volume of oil. At some point in the future, we will find a replacement for oil, long before we run out of it. I agree we consume it faster than the Earth generates it at this time. I don’t agree that bio-engineering won’t find a way to reverse that trend. We have the keys to the kingdom with DNA. Computer processing power has increased enormously (1000 times, 10,000 times, whatever over the last 20 years), and there is no reason to think that the same process won’t happen with bio-engineering. Never say never… It’s just that Moore’s Law doesn’t really apply to manufacturing/production rates. 2) improvement of technology such that we can now economically recover stuff that in the past would have been uneconomical to bother with. 4) we’ll have come up with alternative fuel sources to replace oil long before the stuff runs out. As it is, oil isn’t our only fuel source, we have a good mix of fuels that we use, so even if we run out of one, we have other choices to choose from to replace it.